If a bookmark check reports an error, you can find the corresponding error code in the check log file. 4. 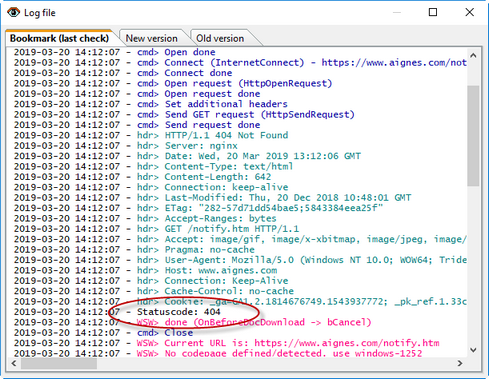 Look for the Statuscode entry in the log, for example "Statuscode: 404"
If a mis-configured server sends an error code but an existing page, WebSite-Watcher will behave differently than your Internet Browser. While an Internet Browser shows the page (the error code can be found in the browser console), WebSite-Watcher reports an error. 4. Check the option "[x] Ignore error codes from server"
Then WebSite-Watcher will ignore the error code and show the page, similar to your Internet Browser. See also this Knowledgebase Article.